A SWOT Analysis is one of most commonly used tools to assess the internal and external environments of a company and is part of a company’s strategic planning processCorporate StrategyCorporate Strategy focuses on how to manage resources, risk and return across a firm, as opposed to looking at competitive advantages in business strategy. In addition, a SWOT analysis can be done for a product, place, industry, or person. A SWOT analysis helps with both strategic planningStrategic AnalysisStrategic analysis refers to the process of conducting research on a company and its operating environment to formulate a strategy. The definition of strategic analysis may differ from an academic or business perspective, but the process involves several common factors: Identifying and evaluating data relevant to the and decision-making, as it introduces opportunities to the company as a forward-looking bridge to generating strategic alternatives. 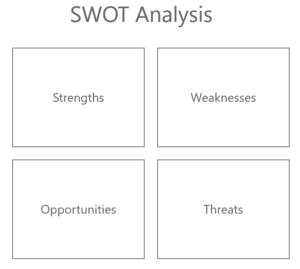 SWOT is an acronym for Strengths, Weaknesses, Opportunities, and Threats. A SWOT analysis is divided into two main categories: internal factors and external factors. It’s important to point out that strengths and weaknesses are current or backward-looking, and opportunities and threats are forward-looking. By performing a SWOT analysis, we will be able to build a bridge between what the company has accomplished to date and the strategic alternatives that are going to be generated. Internal factors are the strengths and weaknesses of the company. 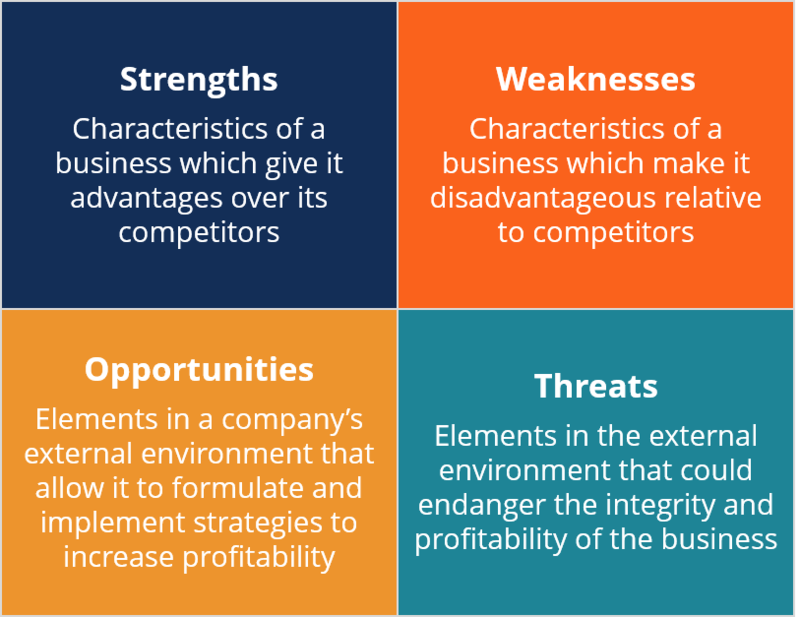 Strengths are the characteristics that give the business its competitive advantage; while weaknesses are characteristics that a company needs to overcome in order to improve its performance. External factors are the opportunities and threats to the company. Opportunities are elements that the company sees in the external environment and that it could pursue in the future to generate value. Threats are elements in the external environment that could prevent the company from achieving its goal or its mission or creating value. Government regulationsFiscal PolicyFiscal Policy refers to the budgetary policy of the government, which involves the government manipulating its level of spending and tax rates within the economy. The government uses these two tools to monitor and influence the economy. It is the sister strategy to monetary policy. To conduct a SWOT analysis, identify the strengths, weaknesses, opportunities, and threats to your company. Consider strengths from an internal and consumer perspective. What unique resources that you have that others do not? What positive consumer perception does your company have? What low-cost resources do you have access to that others do not? Consider weaknesses from an internal and consumer perspective. What weaknesses do consumers see in your company? What factors contribute to a weaker brand image? Consider opportunities from an external perspective. What good opportunities are available in the marketplace? What are some trends that your company can capitalize on? Are there any changes in technology and markets that your company can take advantage of? Are there any changes in lifestyle, social patterns, etc., that your company can take advantage of? Consider threats from an external perspective. What obstacles do your company face? Is the change in technology threatening the position of your company? What threats do your weaknesses put you at risk of? Do changes in lifestyle, social patterns, etc., pose a threat to your company? A SWOT analysis is a simple and effective framework for identifying strengths, weaknesses, opportunities, and threats that a company faces. It is important to leverage on strengths, minimize threats, and to take advantage of available opportunities. Conducting a SWOT analysis is useful for strategic planning and for determining the objectives of a company. Enroll today in our Corporate & Business Strategy course to learn about the three levels of strategy, external and internal analysis, and the strategic planning process.